A newlywed husband and wife from Watertown, Massachusetts, extreme New England Patriots fans, say they won't go on their honeymoon until quarterback Tom Brady is exonerated. "We're die-hard Pats fans and we're going to stand up with our quarterback and do what's right," said Paul Goodrow. "Some people may think we're weird, but this is our life, this is what we believe in, this is what we love." Paul and Kellie Goodrow were married back in May. 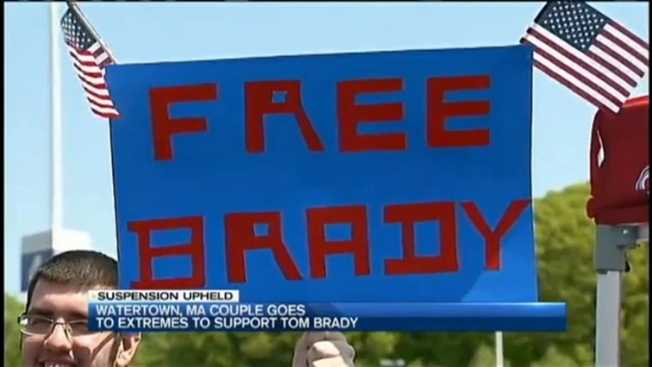 Necn initially caught up with them shortly after their wedding at a "Free Tom Brady" rally at Gillette Stadium following the "Deflategate" controversy. That's when they initially said they were holding off on their honeymoon until a resolution. Now they say they still won't. "My mother's actually paying for our honeymoon, so as soon as he's back on the field, then we're going to Bermuda," he said. The couple's apartment is also filled with Patriots memorabilia. There's championship rings, a replica Vince Lombardi Trophy, helmets, pictures, photographs with Pats owner Bob Kraft, autographs, even a Patriots helmet that Paul just made out of plaster. Paul even has the Patriots logo tattooed on his chest, along with Tom Brady, Teddy Bruschi and Bill Belichick tattoos on his leg. He says he plans on getting more. The Goodrow's also say they go to training camp every year. They make it a family affair and plan on going this week.